The pilot was captured on July 21 when the DPR militia knocked his attack aircraft near Marinovka. Militia interrogation of prisoners pilot Ukrainian Su-25. 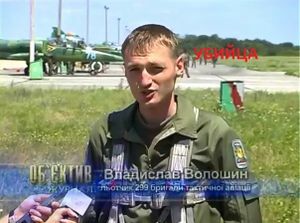 A native of Horlivka 32-year-old Lieutenant Colonel Yuri Shevtsov in 1999 was promoted to squadron commander of 299th Brigade Combat aircraft of Ukraine, which performed air strikes on the Donets Basin. During interrogation, Shevtsov named 13 of his colleagues who participated in sorties during the military operation. He evaded to answer a direct question about the purpose of the sorties, saying he "is no longer sure of anything" According to the militia, three from the list were presented with the state awards - the Order of Bogdan Khmelnitsky III degree - for courage and heroism- on June 20 by the commander-in-chief of the Ukrainian Armed Forces, Petro Poroshenko. Pomogailo Vladimir Anatolyevich - the brigade commander, Colonel. Sergey Samoilov - deputy brigade commander, Colonel. Vitaly Volkov - deputy brigade commander, Colonel. Dyakiv Alexander Y. - Stash navigator, Lieutenant Colonel. Strom Igor G. - head of security operations, Major. Artem Nikolayenko - Head of Combat Training, Major. Vyacheslav Ovchinnikov - deputy squadron commander, Major. Maxim Zhukov N. - commander, Captain. Ruchka Ilya Nikolayevich - commander, Captain. Dziubenko Vadim V. - squadron commander, Lieutenant Colonel. Lagachev Vladimir Vladimirovich - deputy squadron commander, Major. Vladislav V. Voloshin - commander, Captain. Matytsin Boris Nikolayevich - Chief of Staff of the brigade, Colonel. As reported by the militia, the aircraft 299th Aviation Brigade of the Armed Forces of Ukraine during the military operation in the Donbas took part in more than a dozen sorties and attacked the Lugansk, Donetsk and several surrounding villages. Wing Commander, Captain Voloshin Vladislav, FOR KILLING CHILDREN OF DONBASS awarded the Order of Bogdan Khmelnitsky III degree. The blood of Donbass civilians is on his hands. There are "many signs" that flight MH17 was shot down by a Buk rocket, says chief prosecutor Fred Westerbeke, who coordinates the investigation into the disaster, in an interview with the NIS. Yet that is not the only scenario examined in the study, stresses Westerbeke. It also looks at the possibility that the aircraft was shot down from the sky. SBU: Captian Voloshin did not perform any flights on 17 July. "Information about Captain Voloshin is totally groundless. Aviation was not used at that time. On that day, Captain did not perform flights, and his plane was under repairs" (TASS, quoting Ukrainian media). Adviser to SBU chief Markian Lubkivskii denies Komsomolskaya Pravda report. "It was determined that on 17.7 Ukrainian Air Force was not used, in accordance to ATO operation plan. "That was due to search and rescue mission, to rescue crews of AN 26, and SU 25 of Ukrainian Air Force, shot down on 14 and 17. 07. Absence of Ukrainian military planes in the area of the civilian airline crash is confirmed by objective control data of a system of data collection and processing of radar data of Dnepropetrovsk control center "Украэрорух" (UkrAirRukh). Voloshin confirmed that during ATO operation he did not use weapons against any airborne targets. SBU reports that Voloshin explanations are confirmed by objective flight control data of his military unit. How to reconcile this with the Vladislav Voloshin story? Wild, wild speculation: the Russians are telling the truth about Kolomoisky, Yakatsuts and Petrenko, where the Ukrainians have decided that they can’t resist the truth much longer and that they are pushing a fall guy into the spotlights, Vladislav Voloshin, to keep the real perpetrators and Ukrainian power brokers in the dark. Voloshin confirmes that Russian witness indeed worked with him at the same base as a mechanic. Sov. 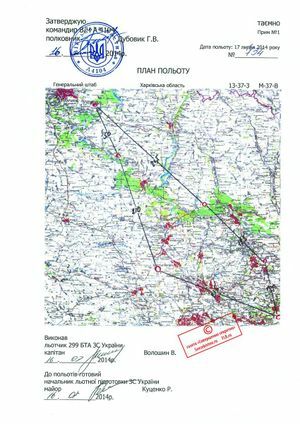 Sekretno publishes apparently fake document with 'Voloshin V.' now ordered to fly by commander of military unit A/4104 based in Chuguev ordering (he was with 299 brigade of tactical aviation and flying from Dnepropetrovsk in previous reports, see above). Rus., Eng. 299 brigade of tactical aviation is officially based in Nikolaev, may be flying from closer airports of course, but previous story, above, was with him flying from Dnepropetrovsk. In 2014 video, it is mentioned that his flight from Chuguevo was on the previous day, 16 June, 2014. 8 July, 2017. Voloshin retires from armed forces, posts on social media. Not much detail relevant to MH17, but a passing phrase of the sort that he was (wrongly) accused, but will go on with his life (lit: I survived accusations of 'murdering children of Donbass' and death of 298 people from Malaysian Boeing, and will survive your comments too. We will live. Glory to Ukraine!). This post and a photo also on Cassad. Я пережил обвинения в «убийстве детей Донбасса» и смерти 298 человек малазийского Боинг-777… Уж ваши реплики я точно переживу. Будем жить. Vladislav Voloshin shot himself in the chest with a Makarov pistol. This page was last edited on 19 March 2018, at 01:29.